"Law Enforcement, Courts Need to Better Understand IP Addresses, Stop Misuse," says EFF in a whitepaper released on Thursday. 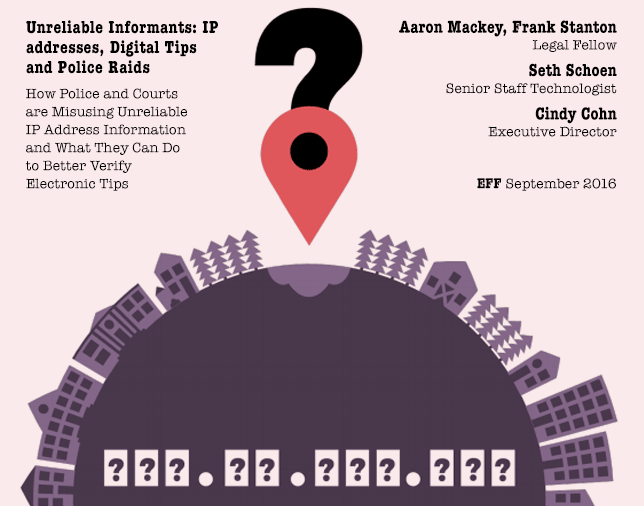 Legal Fellow, Aaron Mackey writes: "[U]se of the IP address alone, without more, can too often result in dangerous, frightening, and resource-wasting police raids based on warrants issued without proper investigation… This paper explains how law enforcement and courts can use IP addresses responsibly in criminal investigations and provides specific suggestions to assist each of them." — "IP addresses information isn't the same as physical addresses or license plates that can pinpoint an exact location or identify a particular person. Put simply: there is no uniform way to systematically map physical locations based on IP addresses or create a phone book to lookup users of particular IP addresses." — "The Constitution requires further investigation and corroboration of rumors and anonymous tips before police can rely upon them to establish probable cause authorizing warrants to search homes or arrest individuals. The same should be true of IP address information." Local Time: Saturday, April 20, 2019 07:28 PM PDT – Page Load: 0.3385 Sec.